Dean is fresh from middle school and enters the college not for a long time. See many roommates joining various community at campus, Dean also has the intention of picking and joining a community. He figures it is a proper channel for making more friends and broadening his horizon. At campus, he comes across a community in which members of it ride electric unicycle. He finds it quite interesting and he takes to this work-out. When he sees the members showing the amazing wheelie on the electric one wheel scooter, he makes up his mind to join it at once. The members of intelligent self-balancing scooter are readily to welcome his participation. They tell him to buy a suitable electric self-balancing scooter. They advise him to buy models of FOSJOAS which is worldwide noted for its quality and technology. Most of its members bought FOSJOAS models. 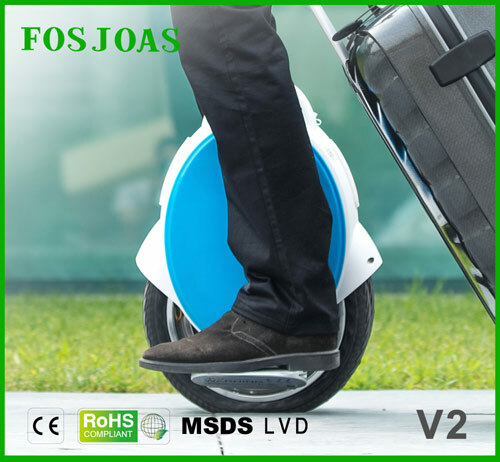 FOSJOAS is the brand of Moben Global Inc., which pushed out a variety of models such as V9, V2, K3 and so forth. As a beginner, Dean is advised to kick off with the twin-wheeled intelligent scooter. They ask Dean to purchase V2. The two-wheeled intelligent scooters like K3 and U3 are indeed user-friendly, it is rather hard to show the thrilling wheelie through these two-wheeled scooters. These scooters are suitable for some common users. Dean aspires to steer electric self-balancing scooter like some veteran players in the community, thereby following their advice and buying a set of twin-wheeled scooter V2. With no experience of riding electric self-balancing scooter, FOSJOAS V2 self-balancing two wheel electric scooter costs Dean much time on learning and practice. Fortunately, members of this community are easy-going and helpful. They help Dean and lead him to practice during riding V2. Dean also spends a lot time on practice. His hard work and determination touches other members who firmly believe Dean will be a veteran player. Surely enough, Dean does not live up to their exception. Through weeks’ practice, Dean becomes highly skilled at riding electric self-balancing scooter at last.